Why should we mark World Environment Day 2016? World Environment Day aims to raise awareness worldwide of environmental issues and encourage political attention and action. 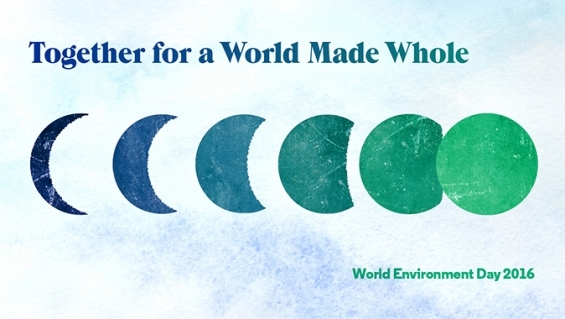 The day was established by the United Nations Environment Program and the World Meteorological Association in 1972 and is celebrated annually on 5 June. This year Churches have a special opportunity to mark this event in worship, as June 5 2016 falls on a Sunday. UnitingJustice has a resource for congregations here. This resource contains theological reflections, worship resources, ideas for action and stories of inspiration and hope to encourage us to think of what changes we could undertake together for a world made whole. Alternatively you could use the topic for a small group discussion. It is becoming increasingly urgent for us all to pay attention to the impact of global warming. Recently the World Bank reported that the world is badly prepared for the impact of climate change natural disasters, which threaten 1.3 billion people on this planet. “The creation, the land, is something we should all honour and respect because creation, which includes all the birds and the animals, embraces all our lives – physically, socially and most of all spiritually, because creation shows us the existence, not only of the raw beauty but it also shows the nurture of the divine and greater spirit, the creator, who will nurture our lives similar to how creation is nurtured. That makes for every human being not only a purpose, but teaches the reality that we belong together and need to respect each other”. Previous PostJoin us at the Perth People’s Climate March November 29 2015Next PostDroughts, storms, floods- Time to Act!